Traditional Dalmatian Pašticada is slow-cooked beef in a rich red sauce, usually served with njoki (gnocchi) or home-made pasta. In its original form, this dish can take a couple or three days to prepare, as the beef is first marinated, then roasted slowly. 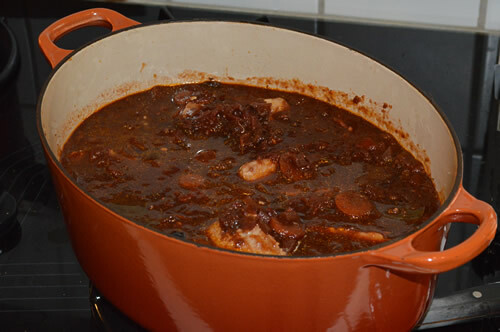 One recipe from Dubrovnik dates from the 15th century, and related dishes can be found in Greece and eastern Italy. Croatian chef and author Veljko Barbieri devotes a whole chapter of his book “Kuharski Kanconijer” to what he calls the “war of the pašticadas”. In Dalmatia, every household has their own recipe, with secret ingredients carefully guarded and passed down from generation to generation, and naturally everyone claims theirs is the “true” pašticada. Barbieri says that the sweet-sour combination is typical of dishes from ancient Greece and the Levant. So the origins of pašticada could be more than two and a half thousand years old! Looking at the ingredients, that could well be right. Red wine and dried prunes? Cloves, olives and honey? The tomatoes must have been a later addition, as would be the potato gnocchi accompaniment. Ingredients from the new world were quickly incorporated into old recipes. At any event, pašticada in one form or another has long been served for important feasts, weddings, etc and today can be found on the menu of the best restaurants around Dalmatia. In our house, we have a problem with beef – himself eats it and I don’t. But not to worry, as tuna, at one time plentiful in the Mediterranean, has long been used in Dalmatia in place of beef. So we make a Tuna Pašticada – a very tasty variation! One great benefit, of course, is that it doesn’t take three days to cook – a mere 3-4 hours is sufficient, although marinading the tuna overnight would add to the depth of flavour. This recipe has been adapted from the multitude of versions we found online, and we’ve successfully cooked it for friends twice now. 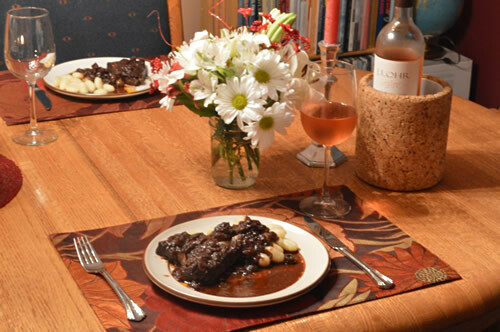 Here is our own version of a very traditional Dalmatian dish. Salt and gently flour one side of the tuna steaks. 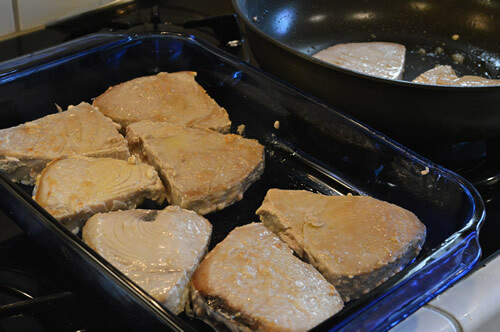 In a large pan, heat up half the oil then fry tuna steaks briefly to sear the outside, first on the floured side. The idea is to seal them well rather than to cook them completely. Put aside to wait for the sauce. 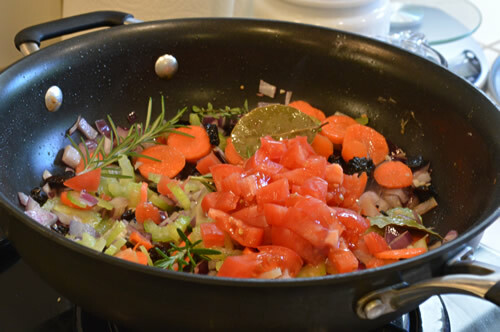 In the same pan, add more olive oil and fry the onion and garlic until it begins to soften. Add the carrots and celery and continue to sweat over a low heat. 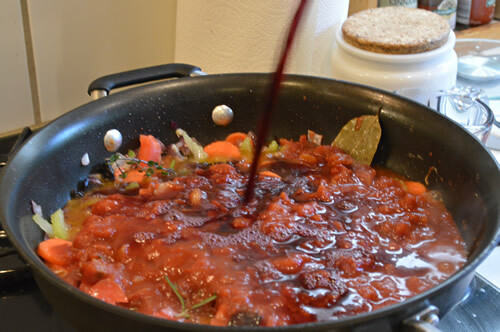 Add half the wine, the chopped tomatoes, cloves, chopped prunes, olives, and everything else. Leave sauce simmering about 40 minutes to an hour. Add water as it thickens. How much? It is a judgement call. You want it thick but still runny and not solid! Once sauce is done, and the veggies soft, put a little in the bottom of a casserole. Layer tuna steaks and cover with the rest of the sauce, add the remainder of the wine and water if needed to completely cover. Put into the oven on a low heat to gently simmer for an hour or so. Do not stir, but just shake the dish a couple of times during the cooking. Taste and adjust the flavour to your liking. If too sweet, add a little more vinegar, if too sour, a touch more honey. A little goes a long way! 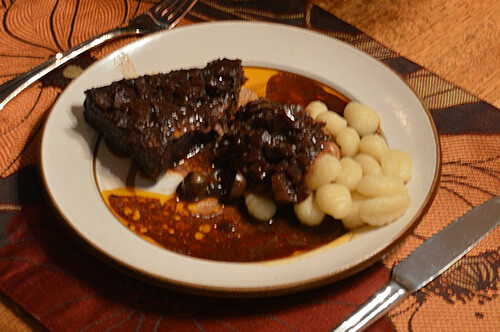 Now as we said at the beginning, pašticada is traditionally served with homemade gnocchi or pasta. However, we’ve found that we prefer it with mashed potatoes, as you can mop up the sauce better, and not waste a drop! This is actually two questions in one. Firstly what wine to use for the cooking. You will use most of a bottle but don’t just go for something cheap, as this is an important ingredient. Think about what it’s going to contribute to the flavour! A big red with a goodly amount of acid and tannins is perfect. We liked the effect of J. Lohr Tower Road Petite Sirah from Paso Robles. A big Dalmatian red would also work really well, but we had a limited choice of those. Of course Tower Road also went down really well while preparing the dish! The issue of what wine is best to drink with tuna pašticada is an even trickier one. We asked both a famous sommelier and a well-known chef in Croatia what they would suggest, and the answers were rather different! Our sommelier suggested a big robust red, to go with the red wine in the sauce. On the other hand, our chef thought a strong white or rosé would complement the flavours. Both were right in their own way, and it’s down to a matter of personal preference. Here are the wines we have served with our pašticada, and around the table our guests had as varied opinions as the experts did! For myself, I tended to prefer the whites or the rosé as a contrast, though both reds were also excellent. Himself preferred the Plovac Ploški, with the R5 being a really good alternative. I’m saving this one — it sounds absolutely delicious!– Nancy N.